The thing is: I didn't learn how to put on make-up on my own up until I was on my first year in college. If you see my photos from that time (for some odd reason or circumstance), you'll notice how much different I was with the way I dressed and my routine in general. I also didn't convert my blog into a fashion blog until two years after. So being that I only started to learn about make-up recently, I still have a long way to go! I'm always so surprised and intrigued whenever I do learn new things. One of my recent searches on Youtube was actually about caring for your make-up brushes. Even as a beginner, I believe it's good to invest in quality make-up brushes especially if you have sensitive skin like me. I easily break out with the wrong products and I get pretty bad pimple marks so I try my best to think about what I use on my face. And with brushes, I found out that you have to clean them at least after every use and make sure to deep clean them every once in a while. It's called Dry'n Shape and it's designed for your dense brushes, to dry them within a shorter amount of time and whip them back into shape. I think it's a neat idea! They also actually explain how you can clean your make-up brushes in 3 easy steps. In terms of dimension, I think it's fairly easy to carry around if in case you decide to travel with it. It's at 23.5 cm in width and 13.8 in height. If ever you will be buying anything off of the Sigma store online, don't forget that you can get a 10% discount off of your total purchase with the code: JAN2013. 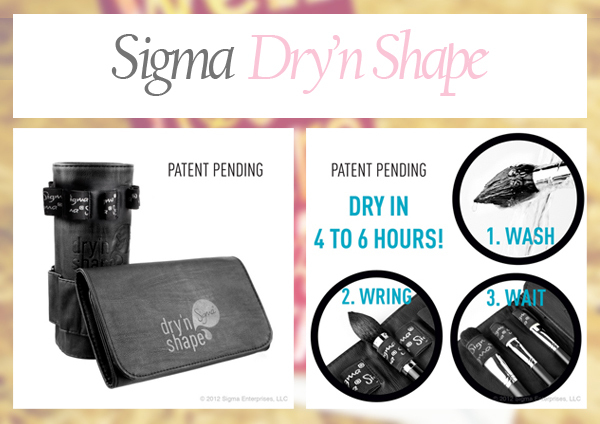 Also, you will receive a gift from Sigma when you purchase $30 or more off of the site. This is a really great idea. Do you think this will work on low quality brushes as well?